As a professional fine art shipping company in NYC, Fine Art Shippers deals with many valuable and unique items created by both contemporary artists and masters of the past. For example, we moved a beautiful painting by Pablo Picasso for a private collector, shipped an antique terracotta sculpture for iGavel Auctions, and even extracted a huge Bansky mural from the wall to preserve it for the future. It is needless to say that Fine Art Shippers has experience, knowledge, and equipment to move and ship artworks of any type, which makes our art shipping and crating company a preferred one for many businesses and individuals. Moreover, we are definitely the right choice for any oversize shipping needs, from moving antique furniture and musical instruments to transporting large and heavy art pieces to another state or country. 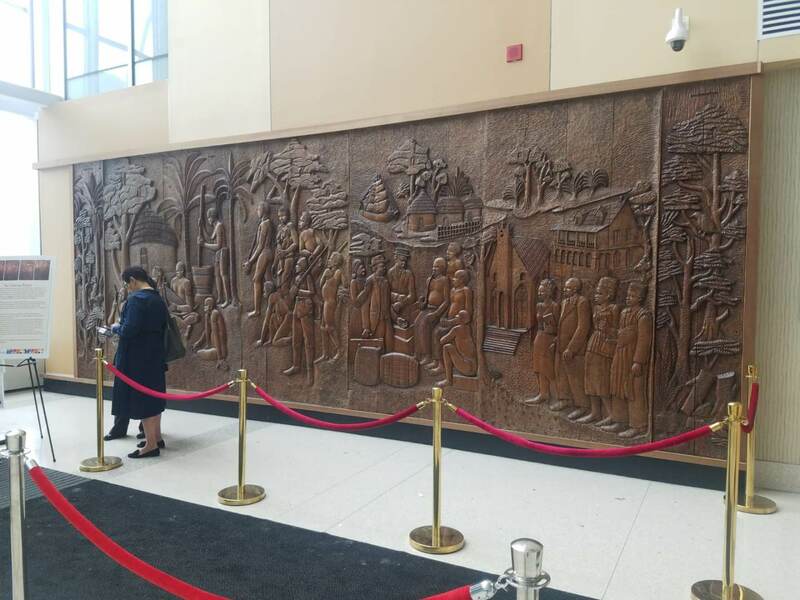 Not so long ago, our team of oversize shipping and crating specialists was presented with a unique opportunity to move the amazing Liberian Relief from its current location at the Mural Pavilion at Harlem Hospital Center in NYC to the National Museum of African American History and Culture in Washington, D.C. This magnificent example of Liberian artistry is composed of 20 panels, each weighing approximately 20 lbs. 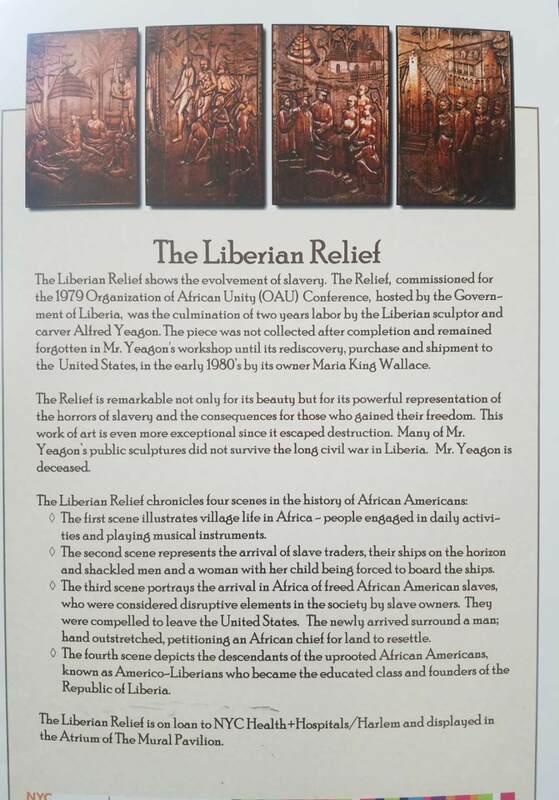 The Liberian Relief, which shows the evolvement of the slavery, was created by Alfred Yeagon for the 1979 Organization of African Unity. 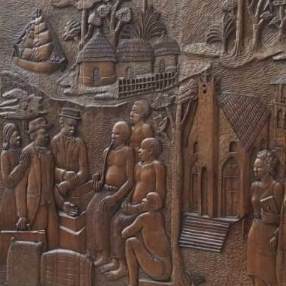 It is one of only a few remaining works in existence by this talented sculptor and carver as many of them were lost during the Liberian Civil War. The Liberian Relief now belongs to the businesswoman and entrepreneur Maria King Wallace who rediscovered, purchased, and brought the masterpiece to the United States in the early 1980s. As it has been already said, this valuable mural is currently on loan to Harlem Hospital Center, but it is expected to be moved to Washington, D.C. for a temporary exhibition at the National Museum of African American History and Culture next summer. At Fine Art Shippers, we are really excited about the opportunity to apply our oversize shipping skills and move this unique piece of Liberian art from NYC to Washington, D.C. Handling artwork like that is an incomparable pleasure! 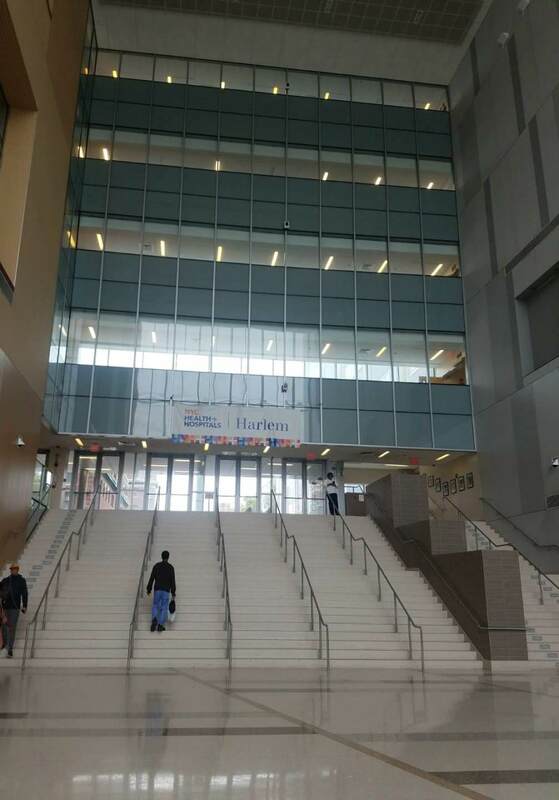 Hopefully, Harlem Hospital Center will choose our art shipping and crating company for this responsible job! Furthermore, our oversize shipping services for art and antiques come at very competitive prices, which makes them accessible to everyone.